How far along are you? 33 Weeks and 2 days. I'm in disbelief I'm over 30 weeks pregnant! I'm so excited to meet my little one. Cravings: Peanut butter on white bread, green apples with peanut butter, apple sauce, Italian sandwiches from Potbelly, hot chocolate, protein in general, water, cheese, etc. Reactions: We keep thinking about how there are only seven weeks left till we meet our little baby! Favorite Moment this Week: I had an ultrasound last week, and the tech switched it to a 4D picture. I've never had a picture like that with Liam. I think those ultrasounds make everything much more real. General Mood: I'm feeling very task oriented since there are only seven weeks left. I have a shopping list and a name list. We're deciding on everything soon! Things I was surprised by: I was all happy at 29 weeks I wasn't having any pain, but now, I'm definitely experiencing some. I'm sleeping in my bed with two pillows propping me up and one under my legs. I'm surprised I'm able to sleep in my bed, but I think it helps I'm been much more in control of my weight this time around. Things I'm most looking forward to: I'm excited to meet our baby and take care of him. Sleep: It's going pretty good. We're all sick and Liam is having a hard time sleeping in the middle of the night so he sometimes sleeps half the night in our bed. 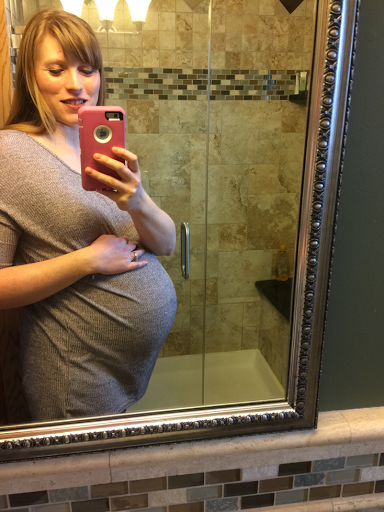 Measuring: At 28 weeks, I was measuring 30 centimeters. I'm going to ask what I am measuring next week at my appointment. 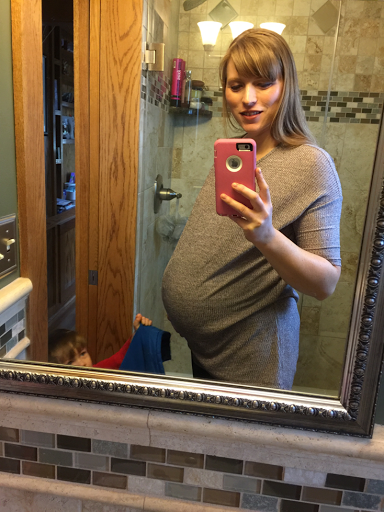 Maternity Clothes: I recently bought a men's fleece from Lands End. It's super comfortable. I got it in a tall to cover my bump. I got it on sale for $26! Baby List: Order the bassinet, the going home outfit, order the baby book and crochet his blanket.